*Featuring soft fabric,soft and comfortable touch feeling, you'll love the feel of this! *Such an essential for your fall wardrobe - you're sure to love wearing it all season long! *The brown Buttons on both sides are the perfect design - paired with the Faux Suede on sleeve and neckline, it makes such a trendy detail! 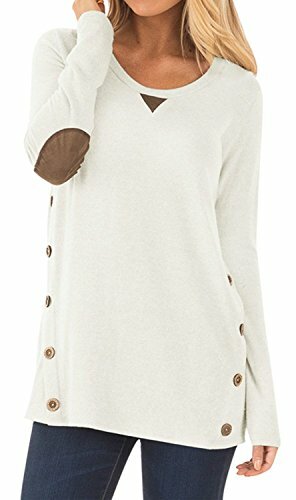 *This tunic tops is made for fall and winter nights! We are in love with the wonderfully soft oatmeal material - it's such a gorgeous and cozy way to celebrate the new season! *This tunic also features a round neck, comfortably stretchy material, and a rounded hemline! It's simply perfect for throwing on over jeans, jeggings, or leggings for a relaxed and chic look this fall! *Take all measurements from the outside with the clothing lying flat, measurements can consist 1-3 cm difference. *Color may look different on individual monitor due to the color setting and lighting etc.